Our spacious Event Center can accommodate up to 400 guests including dance floor, elevated head table, buffet and full service bar. Our rental package comes standard with linens/linen napkins, set up/tear down, a champagne toast for the head table, private room for gift opening, and much more! In addition to the beautiful surrounding of the Event Center, we create a custom room block of spacious guest rooms and suites for your guests needing accommodations. 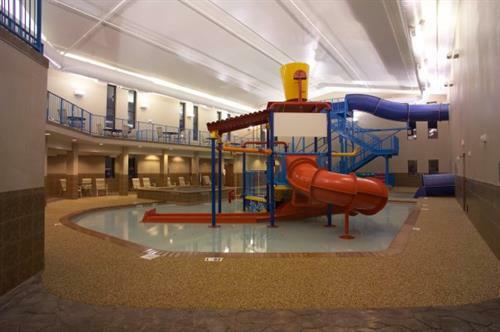 Each room includes passes to our indoor water park, a hot breakfast, and the safety and convenience of being mere steps from the Event Center. Depending on the date that you choose, we can offer discounts on these guest rooms.